The City of Palmdale, County of Los Angeles, and a representative from the Palmdale community advisory group have selected a new captain to oversee patrol services in the city, as well as the unincorporated communities of Acton, Agua Dulce, Leona Valley, Little Rock, Pearblossom, and Vasquez Rocks. Captain Ron Shaffer began his career in 1990 as a deputy sheriff trainee. 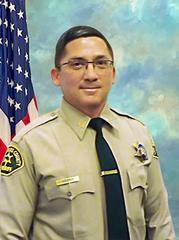 Upon graduation, he was assigned to Pitchess Detention Center before serving at Century, Compton and Santa Clarita Valley Stations as a patrol deputy, field training officer and traffic investigator. Shaffer was also assigned to a Management Task Force where he assisted Custody and Court Services supervisors with use of force documentation. He also helped develop and teach a Use of Force Investigations course. He became a Chief’s aide at headquarters before promoting to Lieutenant at Population Management Bureau. Shaffer transferred to Palmdale Station in 2015, serving as a watch commander and operations lieutenant. He has also been part of an Incident Management Team, having most recently been deployed to the Woolsey Fire. He has been married to his wife, Debbie, for 22 years and they have one adult son. In his off-duty time, he enjoys working on projects on his property and gardening with his wife. "On behalf of the entire City Council, we congratulate Captain Shaffer on his new appointment," said Palmdale Mayor Steve Hofbauer. "His proven experience and leadership qualities make him a perfect choice for the position. We look forward to continuing the outstanding relationship that has been cultivated between the city, the Sheriff's Department and the Palmdale community which has been effective in lowering crime for decades." Shaffer is the first captain to be promoted under Sheriff Alex Villanueva’s new captain selection process which involves city and county leadership and various community stakeholders. The Captain’s panels consist of city, county and other community stakeholders in which the station is located. Once all finalists have been interviewed, the panel chair will make a, heavily weighted, recommendation to the Sheriff, who has the final consideration in appointing a captain. *Text & Email, Register for LASD Nixle messages: To receive more detailed, up-to-date information via E-MAIL and/or TEXT directly from the Los Angeles County Sheriff’s Department (LASD), sign up for "Nixle" alerts at http://www.Nixle.com and register for "LASD – Headquarters Newsroom (SHB), Los Angeles County Sheriff" AND your local LASD station area. Or, to receive URGENT TEXT ALERTS ONLY, text your zip code to 888777. Standard text messaging rates may apply depending on your calling plan.